Rejuvenate your skin with the Elizabeth Arden Eight Hour Cream Skin Protectant Nighttime Miracle Moisturizer, a restorative cream that provides support for your skin as you sleep. The intensely hydrating formula works to seal in vital moisture as the soothing lavender aroma calms and soothes the senses before sleep. Working over night to restore the skin, you’ll be greeted every morning with nourished, hydrated skin that looks and feels refreshed. The lightweight formula will restore and revive tired skin, ensuring your skin looks radiant and healthy every day. After cleansing, warm the moisturiser between hands and breathe in the soothing lavender aroma. Apply generously to the skin in circular motions with attention to areas of dryness. 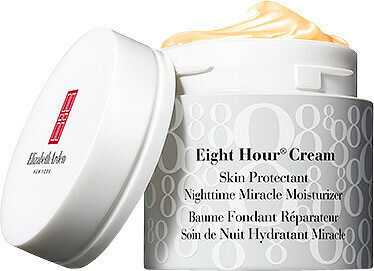 Elizabeth Arden Eight Hour Cream Skin Protectant Nighttime Miracle Moisturizer 50ml is rated 1.0 out of 5 by 1. Rated 1 out of 5 by Yaqian from Arden Eight Hour Night Cream super super thick and difficult to apply. After applying the cream my skin cannot breathe at all, and the worst thing is that it does not hydrate at all. My face turns very oily in the morning and the pores even become larger. I am so disappointed with this product.